Left to right, Donnie Isenbarger will play baseball at Clark College in Vancouver, Wash., Fisher Lewis is headed to Ohio Northern University to play men’s soccer, and Payden Kegley will attend Clark State in Springfield to play women’s volleyball. The three student athletes participated in a mock signing ceremony May 14 at Yellow Springs High School. Donnie Isenbarger couldn’t keep from smiling, along with Athletic Director Nate Baker, prior to the mock signing ceremony May 14 at Yellow Springs High School. 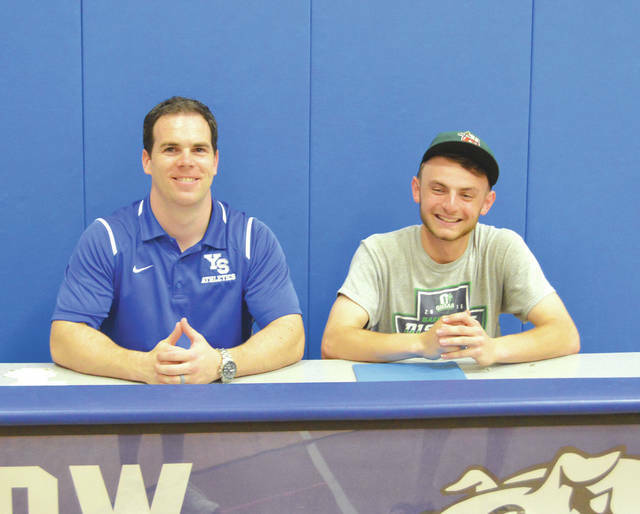 YELLOW SPRINGS — A trio of Yellow Springs High School Bulldogs enjoyed a mock signing ceremony on May 14 as they announced their intentions of attending their respective colleges. 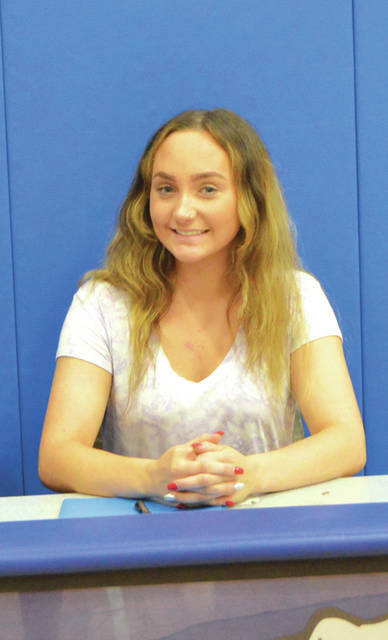 Payden Kegley is headed to nearby Clark State Community College in Springfield, and will play on the women’s volleyball team. 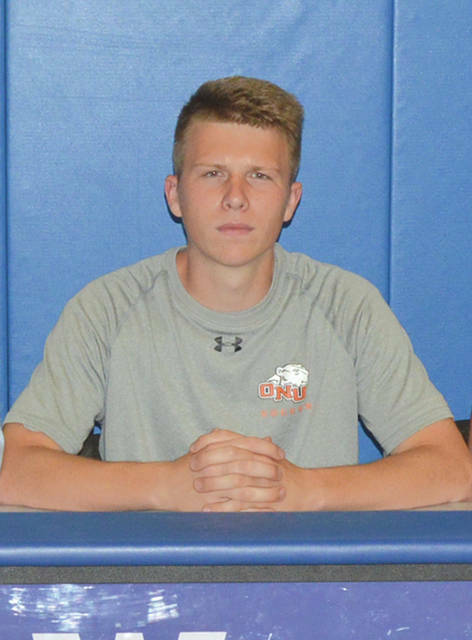 Fisher Lewis will go a little bit further north to Ada, where he will attend Ohio Northern University and compete on the men’s soccer program. Donnie Isenbarger is heading way out west to Clark College in Vancouver, Washington to be with his family while playing collegiate baseball. “Clark State is really close to home. I didn’t want to go too far away for college, and they have the program that I want to do. So it was a good fit for me,” Kegley said. Last season, Kegley led the Bulldogs in digs with 423 as the team’s libero. That mark was second in the entire Metro Buckeye Conference. “I want to become a nurse, and it’s where my mom graduated from,” she added. Lewis, who played defensive midfield and right defender for the Bulldogs boys soccer team, actually led the team in scoring with 16 goals and 19 assists. His parents both attended ONU. He was further convinced to be a Polar Bear when the school attended one of his Ohio Galaxy club soccer matches and soon began recruiting him. “I liked Ohio Northern’s campus, and they had the two majors that I wanted. And also, their soccer program is really highly recognized. In years past, they’ve been very good. They have very nice soccer fields, and their stadium and everything is very nice,” Lewis said. Lewis hopes to double major in biology and business with the idea of attending veterinary school. Isenbarger was one of the Bulldog baseball team’s hitting leaders with a .324 season average this year. A utility player, he said he prefers to play at either second base or shortstop, but saw a lot of action at catcher in 2018. He’s headed west so’s that he can be closer to members of his family, who started moving to the Seattle area “to get away from Ohio” when Isenbarger was a sophomore. “We’ve been going to Portland Trailblazers games out there so often, and we’ve passed that school so many times. It’s basically a mini Clark State. I want to get close to my family again, because it’s been too long, and the school looks like a good fit,” he said. “I like their coach. He’s a jokester! And he seems to like guys who have a passion to play the game.” Isenbarger hasn’t declared a major yet, but admitted to having an interest in automotive design or childhood education. So maybe he’ll become a Seattle Mariner next? “That would be amazing,” he said. https://www.fairborndailyherald.com/wp-content/uploads/sites/50/2018/05/web1_ThreeSignees_PS.jpgLeft to right, Donnie Isenbarger will play baseball at Clark College in Vancouver, Wash., Fisher Lewis is headed to Ohio Northern University to play men’s soccer, and Payden Kegley will attend Clark State in Springfield to play women’s volleyball. The three student athletes participated in a mock signing ceremony May 14 at Yellow Springs High School. https://www.fairborndailyherald.com/wp-content/uploads/sites/50/2018/05/web1_Isenbarger_PS.jpgDonnie Isenbarger couldn’t keep from smiling, along with Athletic Director Nate Baker, prior to the mock signing ceremony May 14 at Yellow Springs High School.